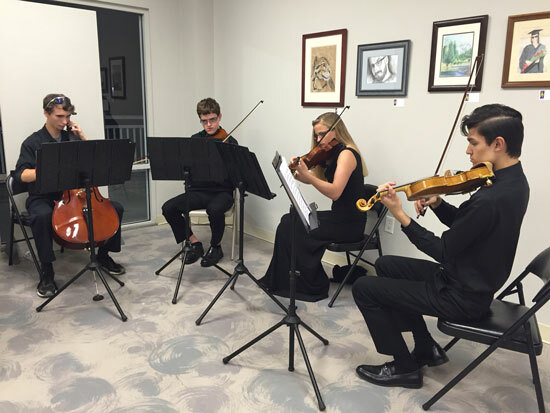 FYO String Quartet members, Jonathan Fisk, Michael Laager, Shannon Hutches and Daniel Masbad play for patrons at the November 2015 opening reception. November 12th through November 29th, 2016. Opening reception: Saturday, November 12, 2016, 6:00 to 8:30 p.m. Members of the FYO String Quartet will provide music entertainment. All shows free and open to the public. 160 Cypress Point Parkway, Suite 207C, Palm Coast, FL. For more information, call 386-986-4668.